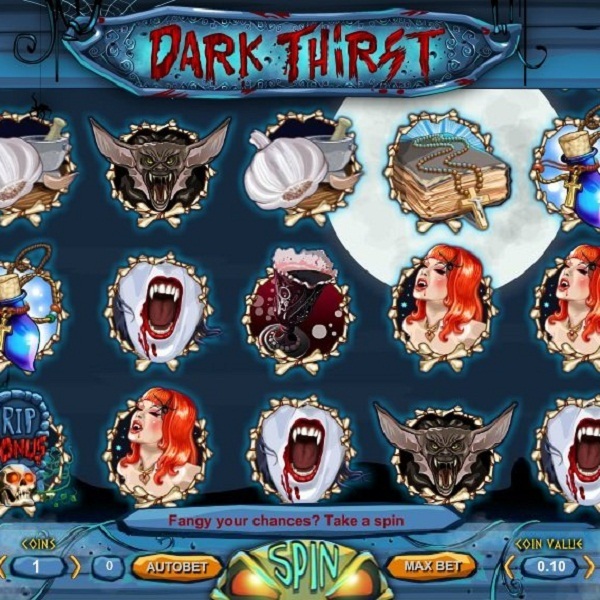 Fans of the vampire genre will enjoy the latest slot machine from 1x2gaming, Dark Thirst. It is a 5 reel, 25 payline game build on a blood curdling theme. The reels are set against a moonlit sky with bats flying in the background. On the reels players will find a range of vampires and other ghoulish creatures as well as some garlic, a vial of holy water and a diary. There is a vampire wild symbol, an RIP bonus symbol and a devilish scatter symbol. Landing three or more scatter symbols anywhere on the reels awards ten free spins which can be retriggered. The bonus game is triggered by landing three or more of the RIP bonus symbols anywhere on the reels. In the game players visit a graveyard where they need to dig up graves in order to uncover cash prizes.